Nineteen of the South Fork’s cultural institutions have formed a new group, the Hamptons Arts Network, to work together to promote artistic endeavors in the Hamptons. The group, which has been meeting for about a year, is hosting its first event, “THAW FEST,” the weekend of March 23 through 25, with programming throughout the weekend at arts institutions throughout the South Fork. About a year ago, Elka Rifkin, Terri Sultan and Andrea Grover, directors, respectively of The Watermill Center, Parrish Art Museum and Guild Hall, put together a plan to gather leaders of arts institutions for cocktails at Baron’s Cove Inn in Sag Harbor. They’ve been meeting on a monthly basis ever since, said Bay Street Theatre Executive Director Tracy Mitchell, who is handing public relations for the THAW FEST. 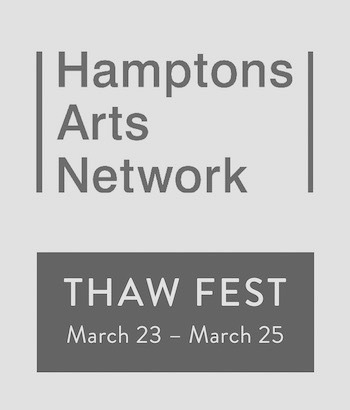 The THAW FEST begins with a kick-off party on Friday, March 23 at the Southampton Arts Center. Events on Friday include a poetry reading from the People’s State of the Union at the Parrish Art Museum, All Star Comedy at the Bay Street Theatre, lectures at the East Hampton Historical Society’s Clinton Academy, performances of “Romeo & Juliet” at Guild Hall and Disney’s “Beauty and the Beast” at the Southampton Cultural Center and a film screening of “Milton Glaser: To Inform and Delight” at the Southampton Arts Center. Saturday’s events include artist talks at The Watermilll Center, tours of Longhouse Reserve, candlelight tours of the Southampton African American Museum, a screening of “Pollock” at the Pollock-Krasner House & Study Center, flora paintings by Robert Dash at the Madoo Conservancy and a lecture on homes of whaling captains at the Southampton Historical Museum. Sunday’s events include film screenings from the Hamptons Take 2 Film Fest at Bay Street Theatre, Sound Bath meditation at the Southampton Arts Center, a King’s Chapel concert at the Southampton African American Museum and open houses and gallery tours at institutions throughout the South Fork. A full schedule of events is online at hamptonsartsnetwork.org and ticket information and registration are on the individual arts organizations’ websites. Ms. Mitchell, of Bay Street Theatre, said the consortium is planning to grow slowly, and may ultimately work to get its own non-profit status, to help get grant funding for the region as a whole. Members of the Hamptons Arts Network include: Bay Street Theater & Sag Harbor Center for the Arts, Bridgehampton Chamber Music Festival, Dia: Dan Flavin Art Institute, East Hampton Historical Society, Eastville Community Historical Society, Guild Hall, Hamptons International Film Festival, Hamptons Take 2 Documentary Film Festival, LongHouse Reserve, Madoo Conservancy, Parrish Art Museum, Pollock-Krasner House & Study Center, Shinnecock Nation Cultural Center & Museum, Southampton African American Museum, Southampton Arts Center, Southampton Cultural Center, Southampton Historical Museum and The Watermill Center.